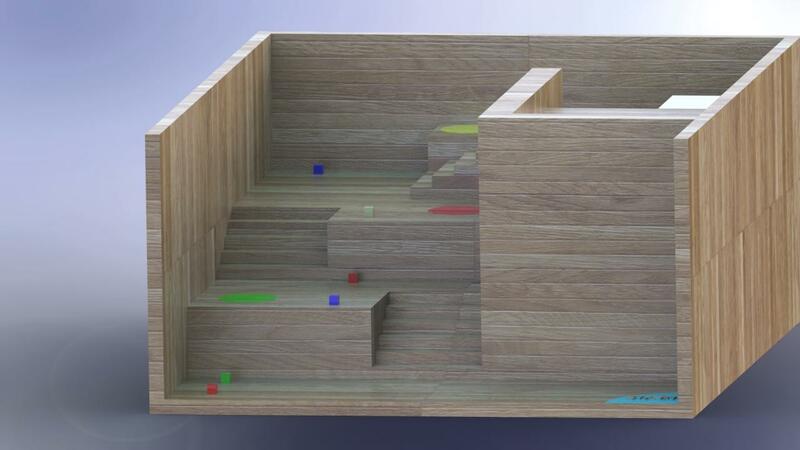 Stair Climbing has always been one area that roboticists have wanted to conquer, considering the ease with which humans do it and the same degree of technical difficulties robots face while doing so. Adding a competitive edge to an already challenging research area, manual event Summit brings an opportunity for the best innovators across the region to aid the design and development of such mechanisms. 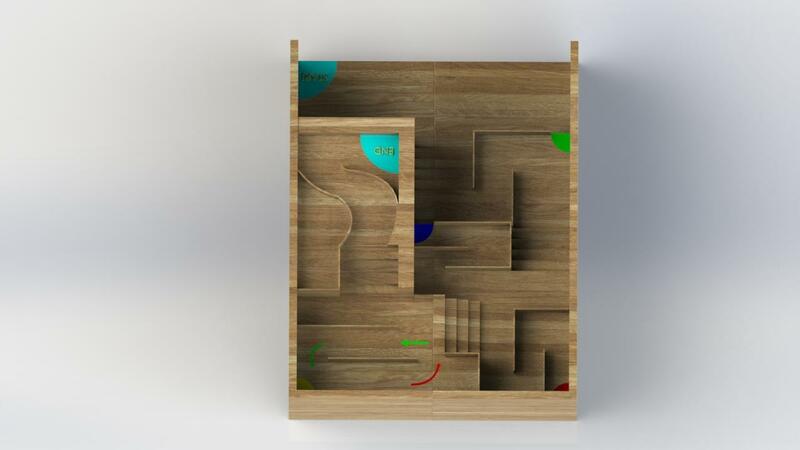 Build a manually controlled robot capable of climbing staircases, whilst picking, storing and placing objects on its way. Climb stairs of uniform height to reach a higher level platform. Collect and store the blocks, and carry them up the stairs. Deposit the objects to the respective deposit zones based on their color. There are staircases of varying number of stairs. The height of the staircase may vary from ± 1 cm. These will be wooden cubes of dimension 3.5 cm * 3.5 cm * 3.5 cm (lxbxh). The upper surface of the object will be provided with a hook for the corresponding lifting mechanism. The weight of the object will be less than 90 g.
Different objects will be colored differently based on their respective deposit zones. There will be some obstructions of height 25cm. Length of obstructions varies accordingly. It is mandatory for the bot to turn at these obstructions. 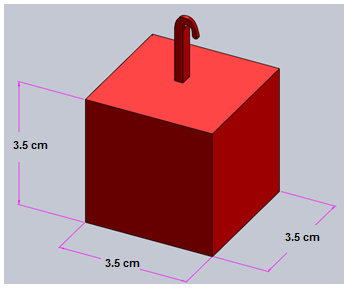 The robot must fit in a box of 30cm x 30cm x 30cm with a tolerance of 10% in the dimensions of robot. No part/mechanism of/on the bot should exceed the given dimensions before the commencement of the event. However the dimensions can change during the course of the run. 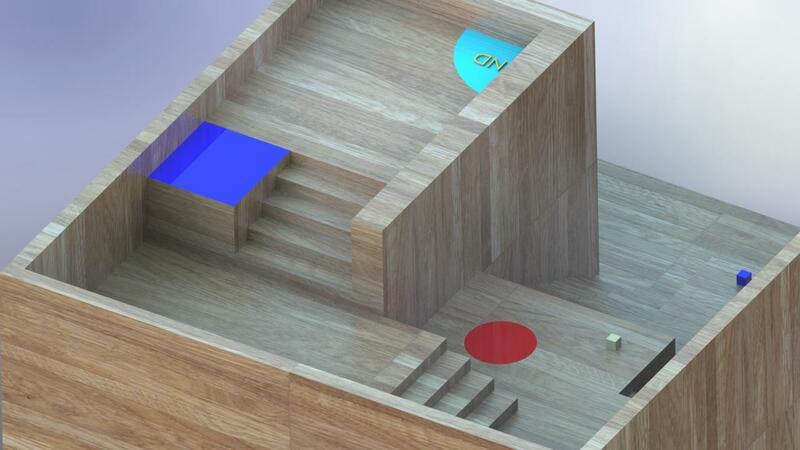 The robot can have any suitable mechanism to climb up the stairs without damaging the arena. 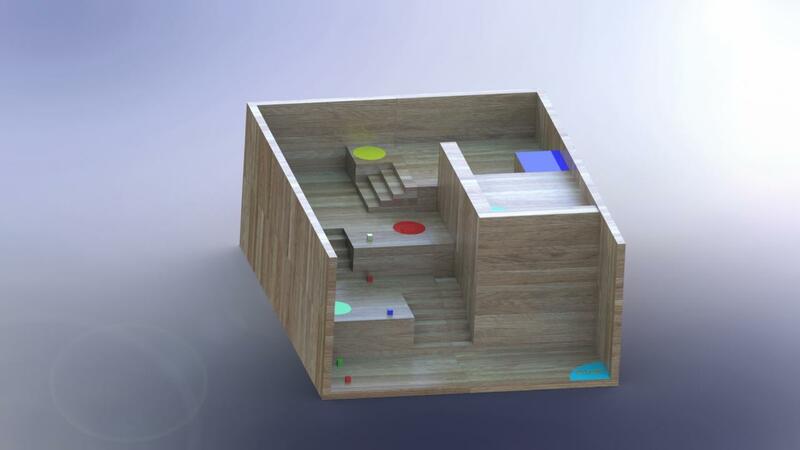 In the second round the robot has to collect and store the blocks, and carry them up the stairs. 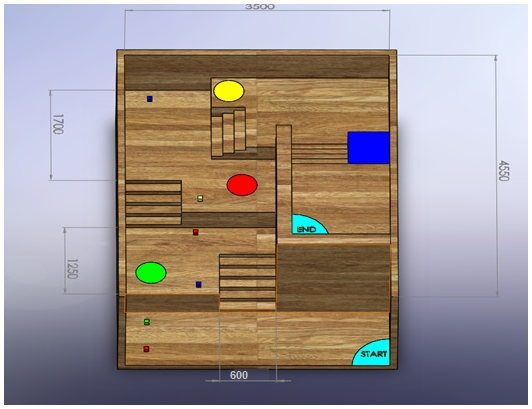 It has to deposit the blocks to the respective deposit zones distinguished by their color. 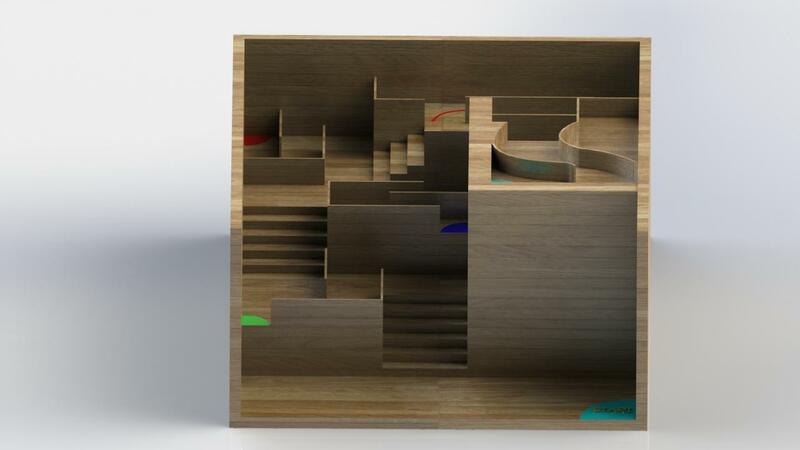 The arena will have some obstructions at each staircase landings, enforcing 90-degree turns. The bot has to manoeuvre around and climb. Points will be awarded for collecting and depositing the blocks at the end of the run. Collected objects: Blocks on the robot. Deposited Objects: Blocks at the platform. The third round will be One-on-One whose arena will be disclosed during the event. No additional mechanism will be required for it. In this round, the length, breadth and height of the arena is 4.5m X 3.5m respectively. The height of stair may vary from ± 1 cm. The dimension of each obstruction is 25cm. The length varies throughout the arena. The robot has to climb up the staircases using a suitable mechanism and without damaging the arena. It has to avoid bumping into the obstruction and the surrounding wall while taking a 90 degree turn. At every point in the arena there will be at least a space of 40cm x 40cm for the robot to maneuver. *The above dimensions are in mm. In this round the dimensions of the arena is 4.55m x 3.5m (l*b). 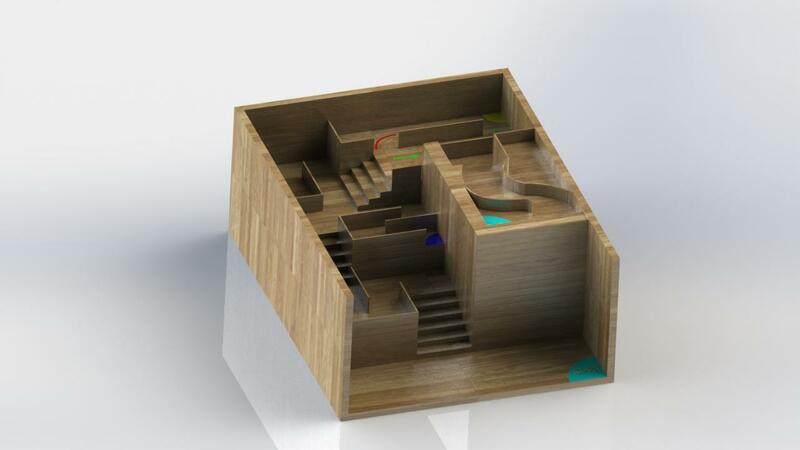 The dimension of each stair is 60 cm x 15 cm x 8 cm(lxbxh). The robot has to climb up the staircases using a suitable mechanism. It has to avoid bumping into the surrounding wall while taking a 90 degree turn. 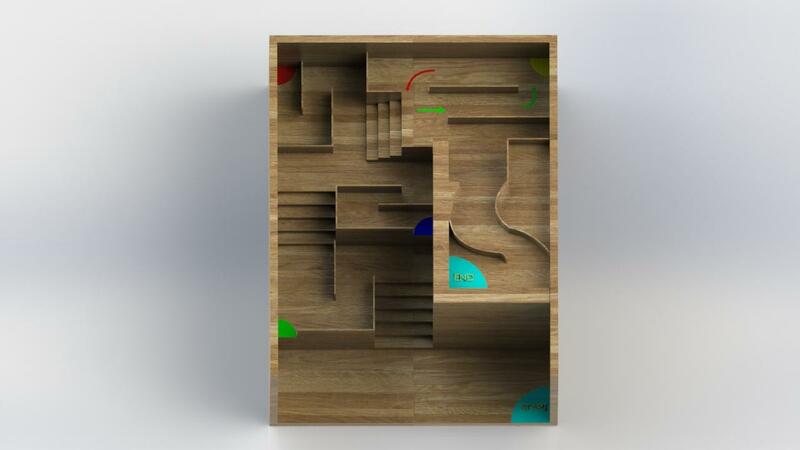 It has to pick up objects placed along the way and store them (optional). It has to deposit the stored objects at certain marked zones on the arena. The object have to be placed according to the colour codes. After the all the blocks are placed the bot has to reach the end zone to finish the round. The task for this round will be declared at the time of the event. No extra mechanical changes will be required for the bot.